(Click the photo for a larger view). I decided to use them to pick out the coral, the “gravel” at the bottom and some bubbles (or as my daughter called them, fish eggs). After adding the beads, they looked a little like an afterthought, so I added some french knots to both side borders to echo the shape of the beads with stitching. I think this makes them look more like a frame because they’re now slightly different to the other lime green seaweed and a little darker. Since that’s what I wanted, I’m happy. I also had a go at learning some other feather stitch variations and some experimenty bits. On the left – whipped triple feather stitch worked in vintage knitting rayon with a firm twist. I found the instructions for whipping it in this style in “Dorset Feather Stitchery” by Olivia Pass. right: whipped feather stitch (called laced feather stitch in the Batsford book but the technique is what many embroiderers know as whipped). 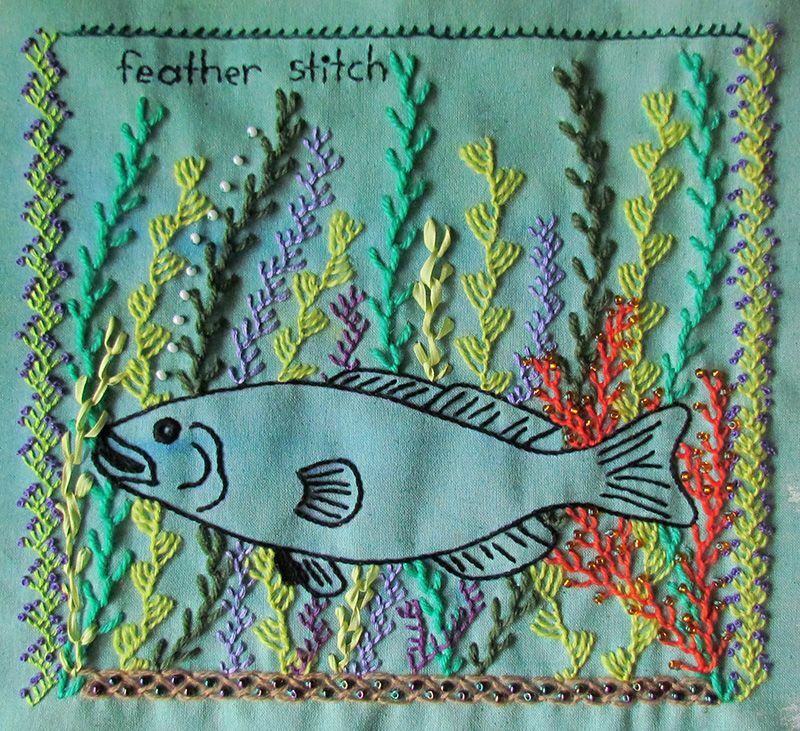 I also tried stitching on an applique because I’d read about it in Dorset Feather Stitchery and wanted to try it. 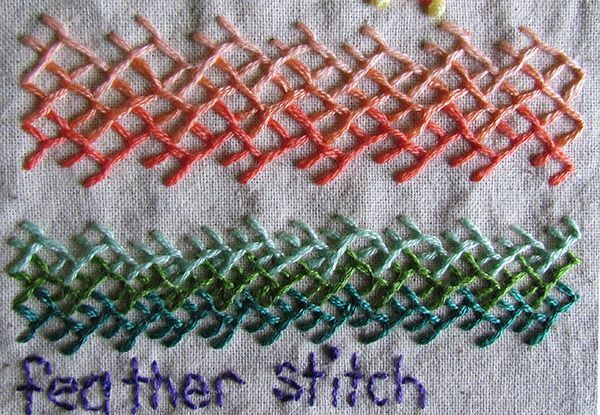 My favourite “new” thing is shaded double and triple feather stitch bands, which I read about in the Mary Thomas dictionary. It’s really difficult to make them neat on plain calico but I kind of like the messiness. Plus if I want them to be perfectly neat I could always rule lots of little diamonds first. I’m having a blast learning lots of new stitches. I’ve mostly used just the basics before (stem stitch, blanket, backstitch, running stitch and French knots, with a little pekinese stitch and some shisha mirrors), and have only just ventured into using anything but 6 strand embroidery floss, so everything is shiny and new. 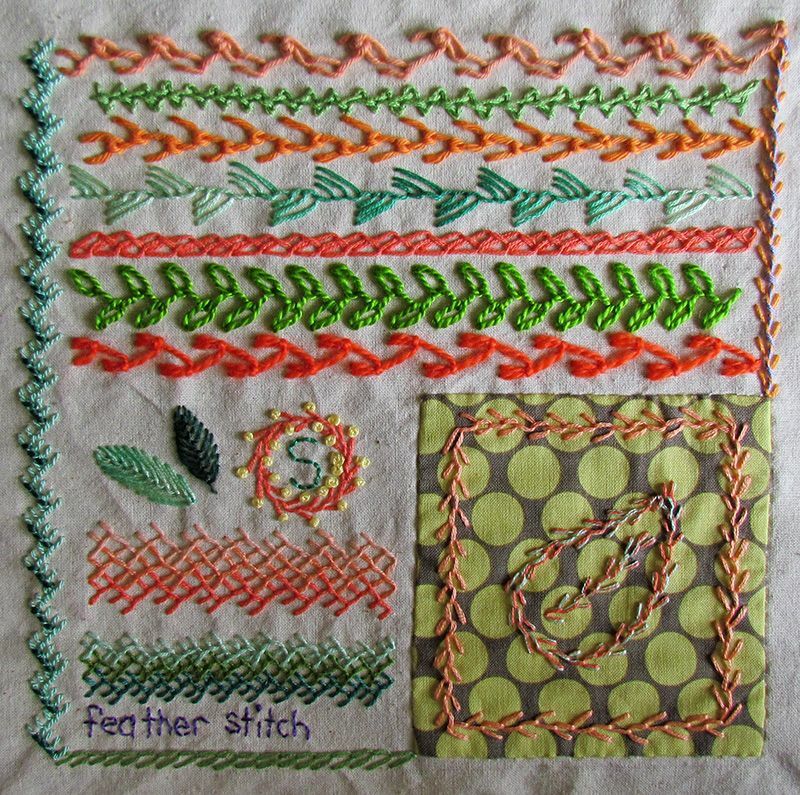 Previous Previous post: Feather Stitch Embroidery Sampler for TAST, Week 3.